We’ve experienced some very weird weather over the last two months: two ‘Beasts from the East’, Storm Emma, and now a heatwave! 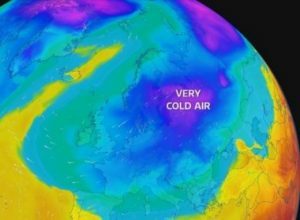 It’s not the norm for us to experience such regular, prolonged extremes in weather or temperature in the UK – as both the Jet Stream and Gulf Stream provide a buffer-of-sorts that maintain our temperate maritime climate. 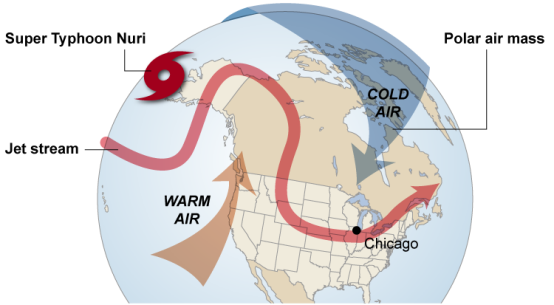 Our weather is predominantly controlled by the Jet Stream – the ribbon-like flow of air that circles the northern hemisphere, from west to east. When our climate is balanced, and the weather is behaving as it should do, (e.g. cold in the North Pole and Arctic Circle, but warmer towards the equator) this ribbon of air flows in a fairly straight trajectory following the temperature gradient. This brings much of our weather from the West, from North America and the Atlantic Ocean. The increased quantity of greenhouse gases (carbon dioxide, methane, nitrous oxide, F-gases, and water vapour) in the atmosphere contributes to global warming – the increase in the overall temperature of the atmosphere. This increase in temperature contributes to climatic disruptions such as melting glaciers and the increase in frequency and duration of extreme weather events, including – floods, droughts and heat waves, severe storms, wildfires, crop freeze events, and winter storms (NOAA). The main reason for the increase of extreme weather events is, as the greenhouse gases mentioned warm the planet, it weakens the temperature gradient of the Jet Stream, disrupting its usually straight trajectory and causing it to meander. These bends, known as Omega Blocks due to their shape (Ω), can pull cooler arctic air southwards (e.g. the Beast from the East), warmer air northwards (e.g. the current, mid-April heatwave), and more intense storms to our shores (e.g. storm Emma). The air in these systems flows more slowly, causing weather systems to become ‘stuck’ over an area, increasing the duration of the weather event and the intensity of its effects. We are already experiencing the effects of global warming on our weather and climate, that is evident from the first four months of 2018 alone. ‘Preventing runaway global warming is the single most important task in human history – and it’s fallen on us to do it.’ (Wake Up, Freak Out – then Get a Grip, Leo Murray) This may seem like a heavy burden to bear; luckily, we know what we need to do to make a real impact. Eat less meat – This can take many forms from Meat Free Mondays to only having meat when you eat out, vegetarianism or veganism. How far you take it is up to you! Avoid 1 (or more) flights per year – Did you know you can now travel to Amsterdam by train from Manchester, with only 1 change in London. This takes about 6 – 7 hours, the same time as flying (getting to the airport, check-in, flying, security, baggage claim, getting to the city from the airport), and gets you right into the city centre! Drive less – Again this can take many forms. You could swap to public transport for your commute, walk or cycle, not drive if your journey is less than a mile, or even pack-in the car altogether.